This petition which including face to face signatures totalled 306 signatures was presented to West Lancashire Borough Council on Wednesday 26th April 2017. Thank you for your support. In January, the Labour council cabinet excluded the public and press from the cabinet meeting and then agreed to negotiations with a private company, Bemrose Mobile, to install Automatic Number Plate Recognition cameras on the Ormskirk Town centre council car parks. The Conservatives did not oppose these plans. We’d like to tell you more but the council report remains confidential. 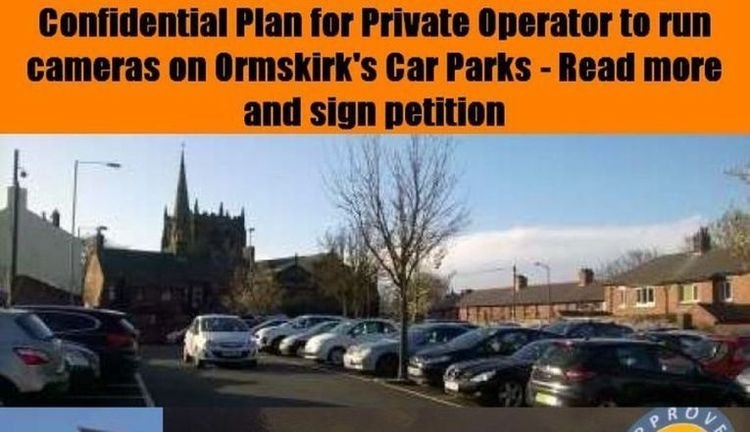 We, the undersigned, call on West Lancashire Borough Council to cease its negotiations with a private sector provider to install Automatic Number Plate Recognition cameras on the Ormskirk Town centre council car parks. The Say No to "Search and Fine" Cameras on Ormskirk Car Parks petition to West Lancashire Borough Council was written by Promoted by Our West Lancashire and is in the category Local Government at GoPetition.